Microsoft's Windows Intune, which launched in March, lets you remotely secure, monitor, manage, and assist PCs via the Internet. One of the first cloud-based PC management systems available, it's basically a streamlined, less-expensive variant of Microsoft's long-lived Systems Management Server (SMS). Intune is a great value for smaller organizations that don't already have a PC management tool. But larger organizations can use it to help manage the mobile workers' laptops. IT providers can use it to manage corporate clients. In this article, I'll explain the major features of Windows Intune, and how to get started with the service. Since the administration console of Intune is Web-based and Microsoft-hosted, there's no server to set up. You use an online console to centrally manage client computers; and from the console, you can check computer statistics, change settings, deploy software, and provide remote assistance anywhere in the world via the Internet. Microsoft charges $11 per PC per month for the cloud-based service, and the price includes a free upgrade to Windows 7 Enterprise (and future versions) for each PC. Microsoft offers a 30-day free trial for up to 25 client PCs. After that you can purchase licenses for up to 20,000 PCs with no minimum number. Windows Intune provides nine main features and coverage areas. 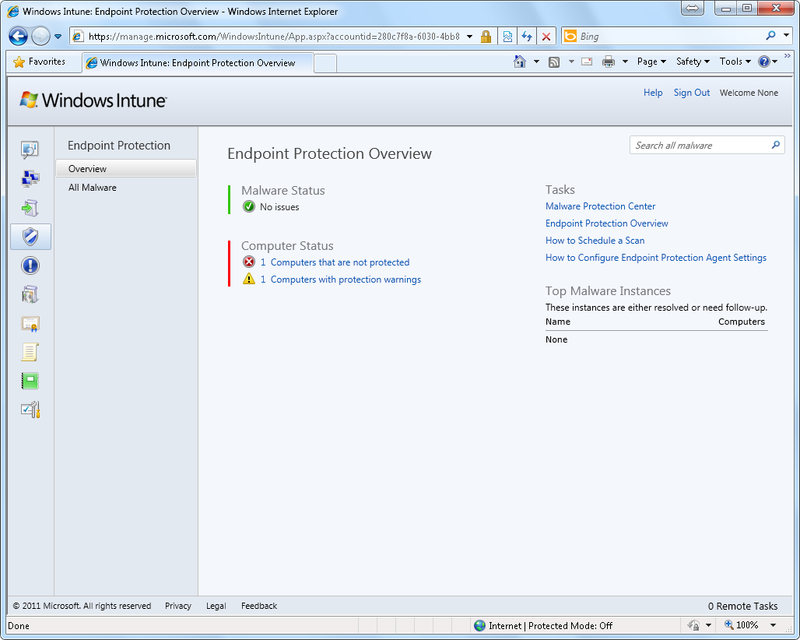 Malware protection: Intune Endpoint Protection is built to protect client computers against viruses, spyware, and other malware. It's similar to Microsoft's Forefront Endpoint Protection (FEP) and to the free Microsoft Security Essentials for consumers. You can push antivirus settings to the clients via policies, and you can remotely start scans and update virus definitions. Windows Firewall customization: You can also push the main settings for Windows Firewall to clients by creating policies. 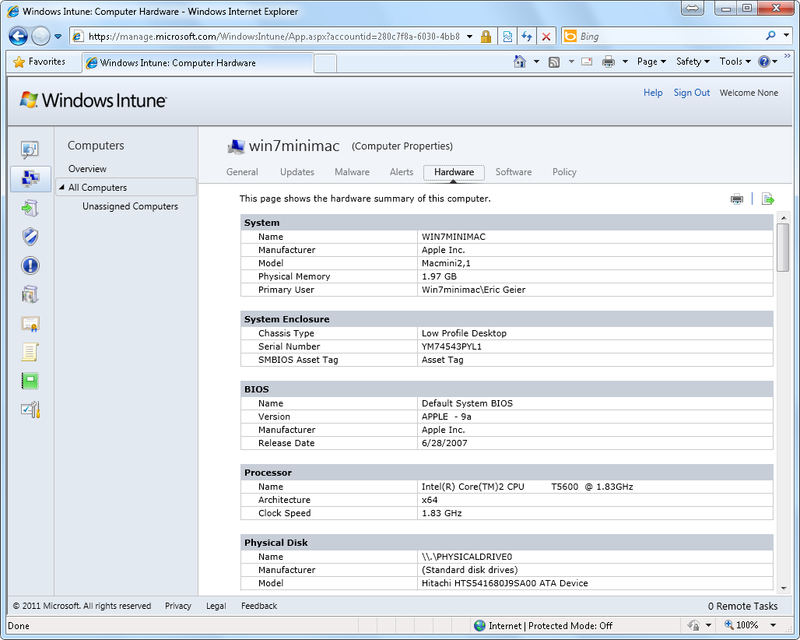 Intune shows the hardware details of a client in the Computers workspace. Remote assistance: This feature enables users to request remote assistance from administrators via the client software, which is called Windows Intune Center. Once you accept and start the assistance, Microsoft Easy Assist handles the remote connection. It supports text chat, file transfers, and desktop and software sharing. Alerts and notifications: After logging on to the admin console, you can see alerts about issues involving your clients, and you can arrange to have email notifications sent to customizable recipients by alert type. Alerts aren't limited to addressing the update status or security status of clients. Other alerts cover such health and security issues as crashing, memory failures, disk corruption, and browsing errors. These alerts let you monitor PCs and possibly recognize problems before they become major issues. Software distribution: You can push Microsoft and other third-party software programs out to clients in the form of EXE, MSI, or MSP files, but they must support silent installation, without any user interaction required. You upload the installation files to your freely provided Windows Azure online storage space, and Intune downloads the files from there when it deploys them to clients. You can even specify prerequisites for the clients, such as supported OSs or updates. Windows update management: This capability lets you view updates for Windows, service packs, and applications that are installed on client PCs. You can also limit installation of updates. The Endpoint Protection workspace shows malware stats and offers links for additional info. Installed software: The option to view installed software covers program information (including version number and vendor name) for the software on each client--a great convenience when you're taking inventory of software or you're troubleshooting software problems. Hardware information: You can view the hardware details of each PC you mange with Intune, including system, processor, BIOS, disk, network adapter, video controller, monitor, and printer information. Software license tracking: This functionality can help you track used and available seats for your software titles from Microsoft Volume Licensing, Microsoft Retail Licenses, Original Equipment Manufacturer (OEM) licenses for Microsoft software, and third-party software licenses.